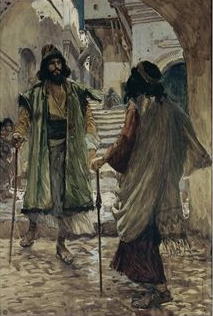 Consider all the incidents that had to dovetail in order for Saul and Samuel to come together: donkeys lost, Kish sends son Saul to look for them, no success, Saul and his servant decide to go see the prophet (Samuel), the servant finds payment for him, they come to the city just after Samuel has arrived. That's quite an impressive string of "coincidences." However, one detail of the story at least is a matter of faith followed by obedience on Samuel's part. Our focus verse highlights it. Samuel has a special kingly portion of food ready for Saul because he has earlier instructed the cook to set aside a special cut of meat for the guest of honor, and this before he knows who that guest will be or has even met him. In fact, it appears the whole sacrificial banquet is arranged in anticipation of Samuel meeting Israel's first king before their paths ever cross (1 Samuel 9:22-24). Do I have ears attentive to hear God's voice and discern His instructions? Do I obey promptly, even when my obedient course of actions doesn't make sense? PRAYER: Dear God, please tune my ears to Your voice and help me to respond with the faith and obedience that acts even when it does not see. Amen. "But the important thing in doing any ministry ... is to make certain that you are doing what you are supposed to do. And above all, you need to listen to the Shepherd. Never go where he does not lead, and never fail to go where he does lead" - Dr. Steven Stiles, Journey on the Hard Side of Miracles, p. 179.